Heist movies, they’re a lost art. So when the remake of “Ocean’s Eleven” came around several years back and wowed me off my feet I was left with this glorious notion that heist movies were suddenly back and in perfect form. Then the sequel, “Ocean’s Twelve”, came along. I don’t think I’ve seen a worse sequel in theaters since “Jason X”. So naturally, once the trailers for “Ocean’s Thirteen” began invading the preview reels my confidence in the franchise was suitably weakened. Well, let me just say, “Ocean’s Thirteen” is everything “Ocean’s Twelve” should have been and so much more. A more than worthy follow-up to the original, it’s likely to be your best bet for this weekend. Reuben (Elliot Gould) is in a bit of a jam, as his Vegas hotel partner, Willie Bank (Al Pacino), has double-crossed him, taking everything Reuben owns and leaving the shock to send him into a catatonic state. Reuben’s protégé Danny Ocean (George Clooney) and his gang aren’t about to take this laying down and join back up to get revenge on Bank and restore Reuben’s bank account. Bank’s new casino is opening up and Ocean’s thirteen intend to break the bank, so to speak, by rigging every game in the house. A tough job, but it doesn’t end there. In addition to that, they’re going to have to ruin his chances of winning a Five Diamond award and steal his collection of diamond necklaces from his fortified loft. 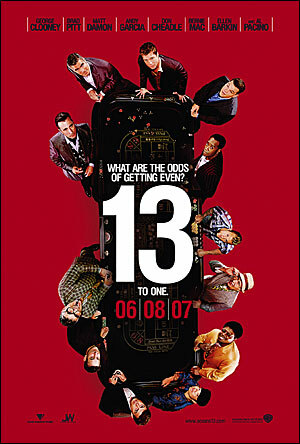 Just about everything that lead me to dislike “Ocean’s Twelve” is gloriously absent from this installment. So that means no space-age hologram machines and no fourth wall-shattering plot devices that save the day in the nick of time. And quite possibly the most important change of all: no Julia Roberts. That woman smiles like a horse. “Ocean’s Thirteen” takes the cast of characters we’ve come to love and returns them to a more familiar setting. However, just because they’re performing another casino heist doesn’t necessarily mean that this film is a retread of “Ocean’s Eleven”. On the contrary, it deviates from the first film for all of its schemes and keeps things nice and fresh. They come up with some very interesting, complex and hilarious methods to rip off the casino and do it with Director Steven Soderbergh’s sense of style and humor. The cast of familiar faces really carry this movie. Although the headliners of Danny, Rusty (Brad Pitt) and Linus (Matt Damon) undoubtedly receive the most face time, some of the less-appreciated members of the crew get more opportunities to shine. I thought Basher Tarr (Don Cheadle) really came out of top in this film, contributing more than most of the other team members. And Yen (Shaobo Qin) also gets to participate more in the disguise and infiltration aspects of the plot, extending his role past the “hired ninja” he was in the previous installments. While some high-tech gadgets do come into play in this film, nothing as ridiculous as the aforementioned hologram machine is to be seen. All the technological doodads employed for the job are quite low key and believable, with nothing anymore outrageous than magnetic dice and reprogrammed slot machines. Well, except this one crazy tunneling device, but it’s actually pretty funny and clever and isn’t some sort of space age James Bond machine, either. Soderbergh tries to keep things on the level in order to add a sense of real world credibility to the scheme. The villain of the film, Bank, is a bit two-dimensional, I’ll admit. Al Pacino delivers a stellar performance (and that should go without saying, he’s Al Pacino), so it’s not his fault. Bank is just sort of an evil jerk for the sake of being an evil jerk, so don’t expect much depth out of him. The villain of the previous two films, Terry Benedict (Andy Garcia), plays a rather pivotal role in the film as a supporter of Ocean’s crew, of all things. They manage his inclusion rather well and he keeps things pretty interesting. All in all, “Ocean’s Thirteen” is the sequel we should’ve gotten in the first place. It keeps things familiar but always fresh. If “Ocean’s Eleven” was an A, I’d give “Ocean’s Thirteen” a B, for certain.